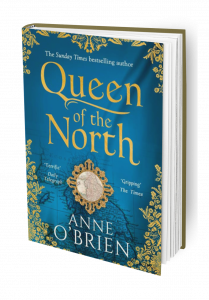 Queen of the North tells the passionate but ultimately tragic tale of Elizabeth Mortimer, daughter of the Earl of March, and Sir Henry Percy, known to history as Hotspur. This is the main entrance to the keep at Wigmore Castle, the most important Mortimer base in the Welsh Marches before they moved to Ludlow. The archway has almost been filled in with earth over the years, but it is a most dramatic site to visit. Why would I choose to write about this dynamic couple? Some of my favourite scenes in Shakespeare are those in Henry IV Part One between the magnificent Hotspur and Lady Kate (Elizabeth Mortimer in real life). It is a relationship full of politics and power, one of conflict of personality and also of flirtation, of love and affection. As a couple they are very appealing and dominate the scenes in which they appear. An if thou wilt not tell me all things true. Do you not love me? Do you not, indeed? I will not love myself. Do you not love me? Nay, tell me if you speak in jest or no. Come, wilt thou see me ride? That fashion’d others. And him, O wondrous him! So who were they, in real life? Hotspur, Sir Henry Percy and heir to the Earl of Northumberland, needs little introduction, such a dynamic, mercurial, glamorous figure in our history. The perfect hero. Brave and courageous, winning glory on the battlefield, he was also flawed, bringing his own downfall. He was more than tempting to write about. 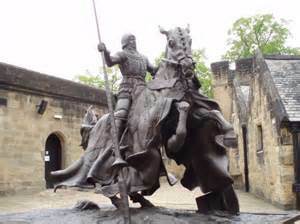 This is the flamboyant statue of Hotspur at Alnwick Castle, the Percy base in the north. It is easy to imagine him just like this in real life. But what about Lady Kate? If I continued to follow my passion to write about medieval women, looking at history from a woman’s viewpoint, who was she? Had she anything of importance to add to the medieval scene? Would she be a suitable heroine to give depth to a novel? It was a surprise and a delight for me to discover exactly who she was. 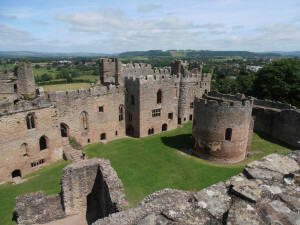 Historically Lady Kate was not Kate at all, but was Elizabeth Mortimer, one of the powerful Mortimer family that ruled over the Welsh Marches where I now live. I am surrounded by Mortimer castles, Mortimer heraldic symbols and Mortimer tombs, so immediately Elizabeth was of interest to me. This of course is Ludlow Castle, one of the main Mortimer bases in the Welsh Marches, which Elizabeth would have known well. Great-grand-daughter of King Edward III, Elizabeth inherited royal Plantagenet blood through her mother Philippa, daughter of Lionel Duke of Clarence, King Edward III’s second son. 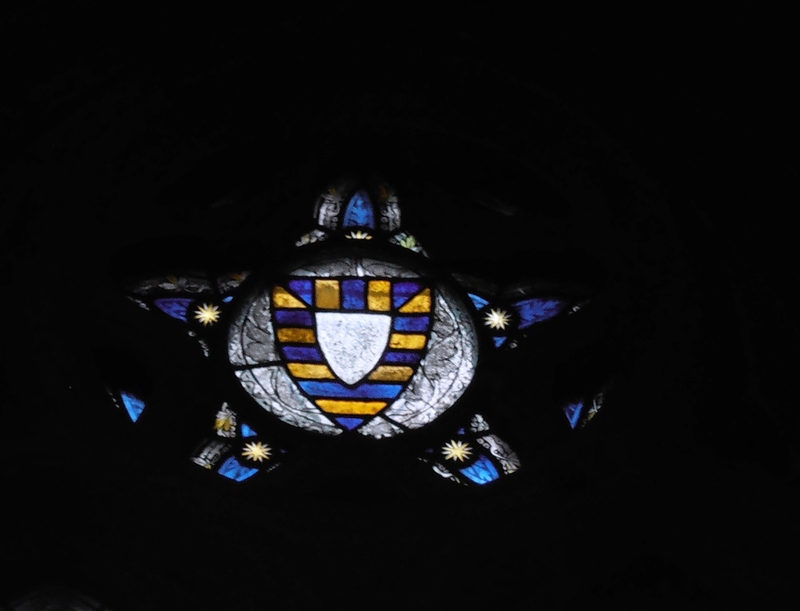 This placed Elizabeth in the centre of the struggle for power from the Mortimer claimants to the throne after the death of Richard II and the usurpation of King Henry IV. All royal cousins, this would be another compelling family saga of power and treason, of betrayal and death. The Mortimer Earls of March had a strong claim to the throne even if it was through the female line. Even better, Elizabeth’s story with that of Hotspur would also draw in a whole panoply of superb historical characters. Henry Percy, Earl of Northumberland, cunning, ambitious and manipulating, determined to keep Percy hands on the reins of power in the north of England. Owain Glyn Dwr, the great Welsh Prince, driven to take up arms in his struggle for Welsh hegemony. King Henry IV, the Lancaster king, fighting hard to stabilize a dangerously uneasy country after the death of Richard II. And then Thomas de Camoys, a most sympathetic character who played a large part in The Queens Choice. What a marvellous set of characters to play with. 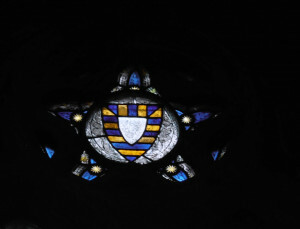 This is the Mortimer heraldry in one of the windows in the Church of St Laurence in Ludlow, a church with very strong Mortimer connections. Why then was I compelled to write about Elizabeth? Because of her Mortimer blood, she was a woman who deliberately took on the role of traitor to the crown in support of her nephew Edmund, Earl of March. 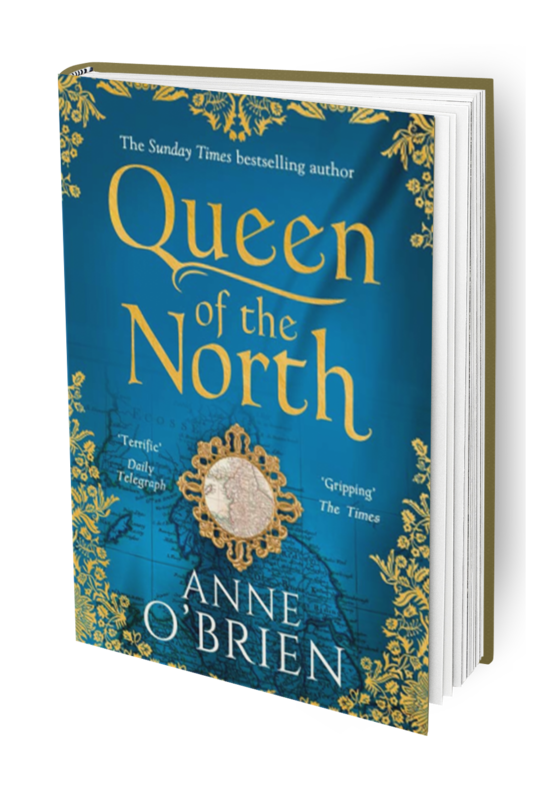 She would know at first hand the resulting struggle between family loyalty and a desire to pursue what she saw as the rightful claim to the crown of England, despite all the pain it would bring her. She would also learn the constraints on her freedom, common to all medieval women. Even more important, she would be forced to accept her own role in her husband’s downfall. Wide ranging through court politics and battlefield honours, all overlaid with a clash of will between two fiery protagonists, it is a story of loss and acceptance, of love and tragedy, of passion and heartbreak. All is here to be enjoyed in Queen of the North. Available in paperback from 18th April, 2019. I hope that you are tempted to buy it! I have so enjoyed reading all of your books. Your style of writing really brings all the characters to life and I get engrossed in their stories. 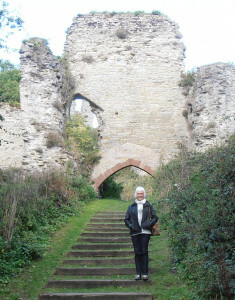 I recently visited Wigmore & Ludlow Castles and spent a few hours imagining what life would have been like in those bygone days. Can’t wait until your new book is published- keep up the good work! Hi Denise. Lovely to hear that you enjoyed Wigmore and Ludlow, which transported you back in time. Thank you for your kind words. All best wishes, Anne. I have just finished Queen of the North, but felt sometimes frustrated by Elizabeth who seemed at times totally intractable but loved Hotspur for his ever ending patience with her. 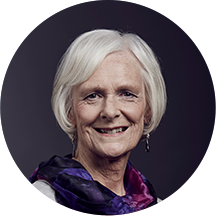 Having said that I loved the book, as I love all your books Anne, if I did not live in Australia I would love to live in England I love to hear your stories of the country side and it just looks so peaceful but we must remember the history side that was not always peaceful. Look forward to your next book.